We live in a universe consisting of galaxies which consist of stars which have planets revolving around them. But one can imagine totally different universes with completely different physical layouts. We can also imagine other universes with laws completely different from the laws of our universe. Let us imagine what it might be like if you had been born in such a universe, one very, very different from ours. One interesting possibility is a universe that is one huge ocean. In this universe there are no stars or planets, and no empty space. This universe consists entirely of warm water, and objects and life floating around in the warm water. There might be absolutely no gravity in this universe. If you had been born in such a universe, you would have no concepts such as the idea of a day or the idea of a year. You probably also would have no home. You would not need one, since you would have no need to protect yourself from bad weather. You would pretty much be like a fish floating around in the water, although you might have arms allowing you to grab things. You would have no idea at all of up or down, and no concept of the surface of the ocean or the bottom of the ocean. It would simply be that no matter how far you traveled in one direction, there would always still be more ocean for you to swim in. If the water in such a universe moved around slowly, you might grow up with your family of oceanic creatures. But if the water moved quickly, you might be separated from your parents very soon after birth, and forced to fend for yourself from a very early age. Living in such a universe, it is rather doubtful that you would be part of any very complicated society. But if you were part of some society, and the society had villages or cities, such centers would probably be sphere-shaped rather than the almost flat cities we see on our planet. Such a universe might be totally dark, requiring evolution to produce alternate senses such as sonar for the various species that evolved. Or perhaps such a universe might be dimly lit by phosphorescent plants and phosphorescent rocks. Now let us imagine an oceanic universe similar to the one just imagined, except for one big difference: rather than consisting only of living things and objects floating around in water, this universe would be only about 90% water, with one tenth of it being air. The air portions would consist of big bubbles of air existing within the ocean stretching endlessly onward in all directions. In such a case there might evolve creatures designed to live within such bubbles. Imagine yourself as one of those creatures. You might live in a small ten-meter wide bubble, where there lived only you or your family. Or you might live in a much larger bubble, along with your family and many other families. Your entire city might be in a bubble. Living in such a bubble, you might be able to jump or fly to any part of the bubble (assuming this universe had little or no gravity). To gather food, you would probably have to dive into the water that surrounded the bubble. Venturing out into the water that surrounded the bubble, you would have to be careful to remember how to get back to your bubble, or you might never see your family again. This type of universe would be very different from anything in human experience, but humans might actually one day be able to experience such an environment. Space visionaries have imagined a space hotel with a zero gravity center consisting of a spherical pool with a big air bubble inside it. Space tourists would swim halfway through the sphere to get to the waterless center. In our universe planets (having diameters of thousands of kilometers) revolve around stars, and stars are separated by huge distances (trillions of kilometers). But it is easy to imagine a very different type of universe in which beings live on tiny little micro-planets, spheres that are only a few dozen meters or a few hundred meters or a few thousand meters in size. Such a universe might have millions of such micro-planets in every unit of space the size of our solar system. Someone might argue that such a universe couldn't exist, because spheres of that size would not have enough gravity to hold an atmosphere. But that objection is not sound, for two reasons. First, we can imagine a universe in which the space between planets and stars is filled with air like the air on our planet. We can also imagine a universe with an entirely different gravitational constant, and in such a universe small spheres might generate enough gravity to hold an atmosphere, and prevent inhabitants from floating off into space. Such planets might get their heat either from regular sunlike stars, or from very small mini-stars, or perhaps just from the background temperature of space (which could be between 60 and 80 degrees in an alternate universe). Now imagine living in such an alternate universe. Your micro-planet might be only 50 meters in diameter. Living on it might be only your family and a few other families. Looking up at the sky, you would not see a vast expanse of empty blue. You would see many other micro-planets. You could probably also see many other people living on those micro-planets. But you might have no way of getting to any of those micro-planets, even though they were only a few hundred meters away. However, if the space between micro-planets was not a vacuum but was instead filled with air, you could probably travel to other micro-planets by using some kind of device resembling wings or a plane. On the other hand, if the space between micro-planets was a vacuum, you might have no way of ever visiting any of the nearby micro-planets. You would see lots of other people in the sky, but would never be able to touch them. It would be most tragic if you fell in love with someone on a nearby micro-planet, because you would never be able to kiss that person or touch that person. But even if you could not visit anyone on a nearby micro-planet, you would probably have some way of communicating with them, possibly by flashing hand-signals, or using lights or fire as signals. 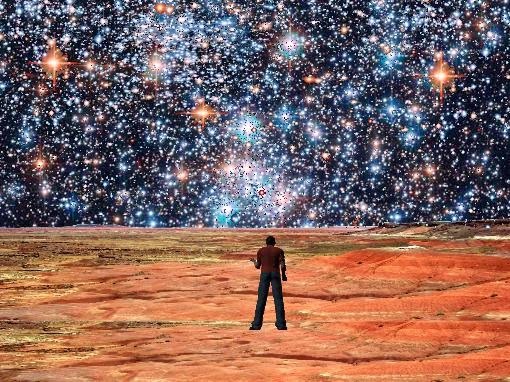 In our universe stars are very far away, but it is easy to imagine a universe in which the distance between stars is a thousand times smaller. 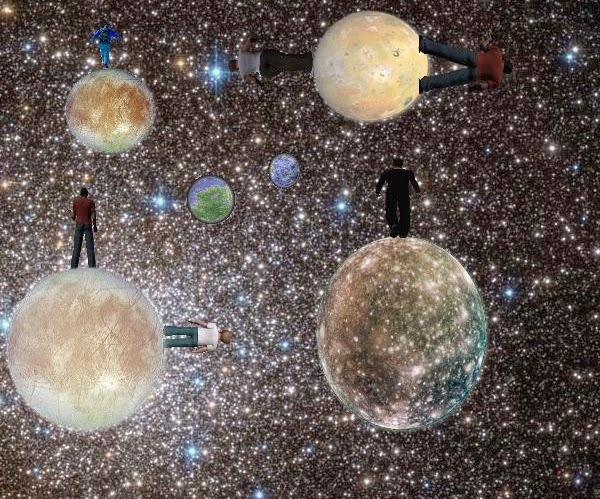 What would it be like living in such a universe? For one thing, the night sky would be far more interesting, with starlight providing as much illumination as the sun. There would be no darkness at night, and the sky at night would look rather like a huge collection of jewels resting on a background of black velvet. If you lived in such a universe, alien visitations would probably be ridiculously common. You might hardly pay any attention when you read in your morning newspaper that another alien spaceship had arrived in orbit around your planet. Your planet would probably already be packed with visitors from other planets, and when you went to a bar it might well resemble the bar in the first Star Wars movie, with a huge variety of alien creatures. In our universe, space is flat or almost flat. But another possible spatial geometry is for a universe to be spatially spherical. If you lived in a spatially spherical universe which was relatively compact, you might experience something incredibly strange as an astronaut. You might set off in a spaceship to explore the deepest reaches of space. After traveling for a long time, you might see ahead of you a planet that looked rather like your own planet. You would be very excited, and say to yourself: what a discovery – another planet like my own planet! As you approached nearer and nearer the planet, you would notice more and more resemblances between this planet and your own planet. Finally, as your ship drew closer, you would at last realize the truth: the planet ahead was actually your own planet, not some distant planet. Because of the spherical geometry of your universe, you would have traveled exactly to where you had started out from. In our universe there seems to be virtually no antimatter, but it is easy to imagine a universe in which there is a great deal of antimatter scattered around. When the tiniest bit of antimatter touches the tiniest bit of matter, both are converted to an enormous amount of energy. Therefore, in an alternate universe containing lots of antimatter, you would not worry much about your career, your bank account, your love life, war, or the next election. What you would worry about above all is something in the sky blowing up and killing you. You would know that every year there would be a significant chance of an explosion in the sky that showered your planet with deadly radiation. So you would probably spend most of your life deep underground, waiting for the end of the radiation shower from the latest matter and antimatter explosion out in space. The previous hypothetical universes are very different from our own. But let us imagine a universe exactly like ours, with one difference: the strong nuclear force is significantly weaker, and the weak nuclear force is stronger. As a result, there is much more radioactivity. All this radioactivity causes everyone to be exposed to high radiation throughout their lives. As a result, almost everyone dies of cancer by the time they get to be sixteen. If you lived in such a universe, you would probably not remember your mother and father, as they both would have died of cancer a few years after you were born. You probably would have been raised by one of your older brothers or sisters. In your society people would encourage marriage between people who just recently reached puberty. It would be the only way to keep your species alive, with almost everyone dying of cancer while they are still teenagers. You would probably only go to school for a few years, and start working at around age 8. If you announced to your boss as a 12-year old that you were pregnant, your boss (who would probably be only one or two years older than you) would congratulate you for following the norms of your society. But you would know that a few years after giving birth, you would also be dead of cancer, along with all of your friends. You, like all mothers on your planet, would weep about the fact that you would never be able to see your child grow up even halfway. Be thankful you do not live in such a universe. There was an interesting story in the news recently about a man who claims to have had a near-death experience after his heart stopped for 45 minutes. Such cases have been reported since at least the 1970's, and more than a thousand cases are described at this site. But during the past 40 years the debate on this particular topic has not changed very much. Many people continue to say that the phenomenon of near-death experiences is an indication of some afterlife. But many skeptics continue to say that such experiences are just hallucinations caused by drugs, some surge of brain electricity, or some surge of chemicals in a dying brain. Those who argue for a paranormal interpretation of near-death experiences argue that the experiences tend to have common characteristics, not the random characteristics one might expect to see in hallucinations. Some of these common characteristics are said to be a sense of floating above the body, travel through a tunnel, a life review, an encounter with dead relatives, and an encounter with a being of light. But skeptics argue that such narrative elements have been widely publicized, so perhaps some kind of wish-fulfillment mechanism of the brain sometimes kicks in near death, using elements stored in the memory. This argument has been going back and forth for decades, but perhaps within a few decades new technology will throw new light on the phenomenon of near-death experiences. I can imagine such a technology. Consider the operation of a commercial web site. A typical large web site has a thing called an audit trail. An audit trail is a set of logs that record exactly what was happening with the web site during any time period. There are typically two main parts of such an audit trail: a web server log that records each and every time some external user accessed a page of the web site, and a database log listing each and every database operation that occurred during a particular time period. With this audit trail, it is then possible to analyze exactly what happened if the web site ever crashes. The support team can then track down the cause of the crash, and try to fix it. Now we can imagine, with sufficiently advanced technology, a kind of audit trail for the human body. This would be a series of chronological records showing over a time period many different states of the human body. This audit trail would be a record of heart rate and brain waves, but it would also have more much more detailed information. It would show the ebb and flow of particular chemicals in the brain. It would show which parts of the brain were becoming active during particular moments of time. This more detailed information would require some technological breakthroughs, perhaps some technology for sniffing remote traces of chemicals (a Star Trek fan might call this “tricorder” technology). Modern jetliners all have a “black box” (also called a flight recorder) that records all states of the different parts of the plane. (The boxes are actually orange-colored, to make them easier to find.) 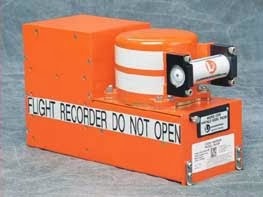 To find out what happened when a plane crashes, it is merely necessary to retrieve this black box. We can imagine a similar type of device for the human body – a little black box that precisely records all changes in vital signals, brain electricity, body chemistry, and so forth. This type of “body black box” would also be useful in helping to resolve the question of whether near-death experiences are mere hallucinations. If a patient claimed to have had a near-death experience, his “body black box” could be analyzed. Looking at the chemical, biological, and electrical audit trail, scientists might look for some unusual trace that might give clues as to a natural explanation for near-death experiences – perhaps a surge of electricity in a particular brain area, or a surge of some particular chemical. If no such clue was ever found, it might lend credence to the theory of a paranormal explanation for near-death experiences. 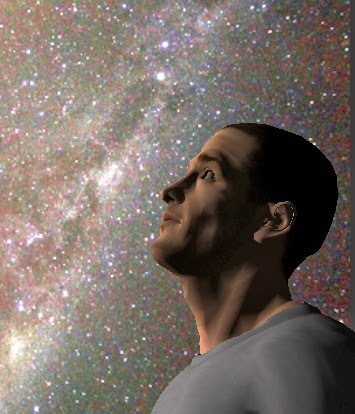 Daniel Duncan had always had the dream of traveling to a distant planet. The problem was that he didn't have the type of background that fitted in with that dream. His family was dirt poor, and couldn't afford to give Daniel a fancy education. So after finishing high school, Daniel got a low paying menial job. But during the evenings and weekends, he would spend most of his time reading about astronautics and astronomy. Daniel loved learning about the interstellar mission that was being prepared by the Society of Nations. 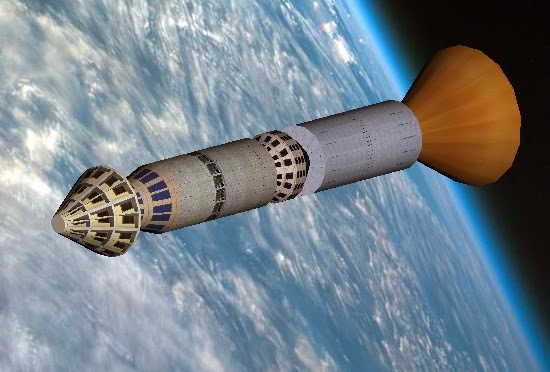 Mankind's first starship was being built in orbit, a starship that would travel to the nearest star system. The system consisted of three stars, including Alpha Centauri B.
Daniel learned that a leader of the mission lived not far him, a man named Bill Ross. Daniel knocked on the door of Bill. He talked the man into letting him inside, claiming it was a matter of great urgency. “So tell me, what's so important?” said Bill. Daniel took a resume out of his pocket. Bill chuckled when looking at it. “I'll take it!” said Daniel, overjoyed. 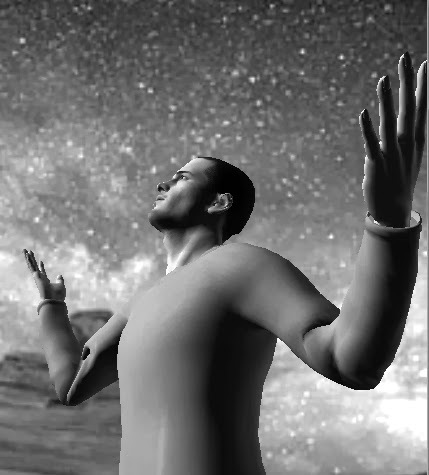 So Daniel was put on the great interstellar starship, which blasted off towards the nearest star system. For ten years the ship traveled through the great interstellar void. For ten years, Daniel performed his lowly tasks. Everyone called him Chore Boy, and no one called him by his name. If a crew member wanted some food, he would call out Chore Boy, get me some food, and Daniel would have to rapidly fetch it. But Daniel didn't mind. He was fulfilling his dream of traveling to the stars. Finally the great starship approached Alpha Centauri B. The ship's captain made an announcement. As the starship traveled through the asteroid belt, a very small asteroid struck the ship. All of the air sucked out of the ship. All of the crew members died except for Daniel. He was the only one who had put on a spacesuit fast enough. Daniel thought to himself: what can I do now? He didn't know how to navigate the starship. But luckily the ship was an autopilot, so it reached orbit around the planet all by itself. Daniel knew he had to act fast. His spacesuit only had one more hour of oxygen. He knew that the starship had a landing craft designed for sending astronauts down to the planet. He went into the landing craft. Luckily the landing craft had a computer that responded to voice commands. 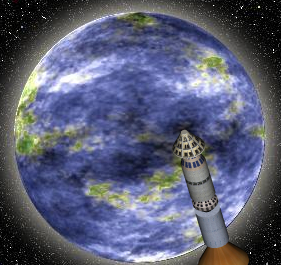 Daniel ordered the landing craft to blast off from the starship, and head towards the planet. The landing craft landed on the planet. “How much oxygen is left?” Daniel asked the computer. “Thirty minutes,” said the computer. Daniel knew this was the moment of truth, He had to leave the landing craft. If the planet did not have a suitable atmosphere with lots of oxygen, he would die instantly. Daniel opened the door to the landing craft, and took a whiff. The air smelled a little strange, but it was good breathable air. Joyfully Daniel punched the air with his fist. Exiting the landing craft, he began walking on the surface of the planet. He walked for miles, and saw nothing but grass and some strange vegetation. I'll probably starve to death, thought Daniel. But at least I made my dream come true. But then he saw something in the distance, miles away, in the blueish tinge of the far horizon. At first it looked like a mountain range. But as he drew closer he saw it was not a mountain range. It was a city! The planet had intelligent life. Daniel knew that in the city ahead there would probably be water and food that would allow him to survive. Walking towards the city, Daniel wondered what type of strange alien beings he would find in the city ahead. Daniel thought to himself: how strange that the first ambassador of the human race to another planet is me, Daniel, the lowly Chore Boy. Which Great Scientific Mysteries Are Likely to Be Solved in the Next 50 Years? As discussed in this blog post, there are many great mysteries that baffle scientists and philosophers. But what are the chances that these mysteries will be solved in your lifetime? Let us look at particular mysteries, and estimate the chance that we will have a solution within the next fifty years. The main mystery involving the Big Bang is what caused it. We are extremely unlikely to ever resolve this mystery in the next fifty years. When we look to the edges of the universe, billions of light-years away, we are looking back in time. But no matter how powerful our telescopes might be, we can never look back to the first 380,000 years of the universe's history. In the first 380,000 years after the Big Bang, matter was so densely packed that photons of light could not travel for more than the shortest length before colliding into a proton or electron. This basically means that light from the earliest stage of the universe is effectively blocked, and we are forbidden from looking back to the first 380,000 years of the universe's history. We can study the cosmic background radiation, dating from this time about 380,000 years after the Big Bang. We have already launched two satellites to do this, the most recent being the Planck satellite. But the observations made by that satellite have offered no new breakthroughs. The chance that we will find the answer to the cause of the Big Bang by studying the cosmic background radiation further is almost negligible. I estimate that there is less than 1 chance in 100 that scientists will solve this mystery in the next 50 years. Super-fast computers will be of no help in solving this mystery. Dark energy is the mysterious energy that is believed to make up about 68% of the universe's mass-energy. Scientists have no clear idea of what it is, although they have a vague suspicion that it may have to do with virtual particles created in the vacuum of space. The hugely expensive Large Hadron Collider has not got us any closer to unraveling the mystery of dark energy. Next year the LHC will begin new activity that will greatly increase the energy of its collisions. It is still very unlikely that this will produce anything helping to solve the mystery of dark energy. As discussed here, there are plans for a 60-mile long successor to the Large Hadron Collider, one that will be completed in 2035. There is not much reason to be hopeful that this will solve the mystery of dark energy, although it may shed some light on it. Super-fast computers will be of little help in solving this mystery. I estimate that there is less than 1 chance in 10 that scientists will solve the dark energy mystery in the next 50 years. Dark matter is believed to be a mysterious type of matter that makes up more of the universe than ordinary matter. The problem with dark matter is that it cannot be directly observed through ordinary methods. So it is very unlikely that we will understand it very well any time in the next few decades. About the most we can hope for are some type of observations that clearly nail down the fact that it really exists. I estimate that there is less than 1 chance in 3 that scientists will solve the dark matter mystery in the next 50 years, in the sense of getting a clear idea of what type of particles it is made of. Very little progress has been made in discovering exactly how life originated on Earth billions of years ago. There was a ray of hope when Stanley Miller did his famous experiments back in the 1950's, but since then progress has been very slow. The prospect of vast strides in supercomputers offers some hope that some progress may be made in helping to solve this mystery. Conceivably vastly improved supercomputers might do some kind of simulation involving billions or trillions of chemical combinations, a simulation that might throw new light on the mystery of the origin of life and the origin of the genetic code. We can also imagine that there might be robotized chemistry laboratories that might help to resolve the issue. I can optimistically estimate that there might be as much as 1 chance in 3 that this mystery will be solved in the next fifty years. The mystery of existence is the age-old mystery of why there exists something rather than nothing. It is a perplexing problem, because nothing seems more natural and plausible than simplicity, and the simplest possible state of existence is complete nonexistence – no God, no matter, no energy, no universe, just absolutely nothing, forever and ever. So why didn't such a perfectly simple state of existence (complete eternal nonexistence) occur? I see no real chance that any new scientific observations can solve this problem, and it isn't likely that supercomputers will help us solve it. There is some chance that we might be able to resolve this mystery by increasing our intelligence, and increasing our ability for philosophical reasoning. We might then be able to understand some reason for existence that we failed to grasp before. But that would require a major increase in human intelligence, which is probably a long way off (the assurances of singularity enthusiasts notwithstanding). I therefore estimate that there is less than 1 chance in 10 that we will resolve the mystery of existence in the next fifty years. There are two ways in which this mystery might be resolved: negatively or positively. We would resolve this mystery negatively if we were to somehow prove that we are alone in the universe. We would resolve this mystery positively if we somehow found out that we are not alone in the universe. There is zero chance that we will resolve this mystery negatively in the next fifty years, and zero chance that we ever resolve this mystery negatively. This is because the universe is too big. Our galaxy has billions of stars, and there are billions of galaxies. Even if we somehow create spaceships capable of traveling instantaneously (something most unlikely), it would still take millions of years to survey all the planets in our galaxy, determining that none had intelligent life. By the time such a job were finished, we still could not say we are alone in the galaxy, because during those millions of years intelligent life could have still have evolved on planets when we were not checking them. And that's just the difficulty of determining that we are alone in the galaxy – the job of determining we are alone in the universe would be billions of times more difficult. When it comes to the possibility of resolving this mystery positively (determining that we are not alone in the universe), we have an entirely different situation. We have a decent chance of doing that in the next fifty years. All we would need to do would be to pick up a radio transmission from another civilization. This is one area where advances in supercomputers might help. Such advances may allow us to scan millions of frequencies for radio signals more efficiently. I therefore optimistically estimate that there is about 1 chance in 2 that we will resolve the mystery of whether we are alone in the universe in the next fifty years. The mystery of cosmic fine-tuning is the mystery of why the universe seems to be so exquisitely calibrated to allow the existence of intelligent creatures such as us. Anyone doubting that there seems to be such fine-tuning should read this post and this post. It is most unlikely that we will discover any final answer to this mystery in the next fifty years, as unlikely as you becoming a lottery millionaire. Despite the misguided enthusiasm of multiverse enthusiasts (who imagine a huge collection of universes, each with different characteristics), there is basically zero prospect of ever being able to confirm such an idea – unless you wish to imagine some machine for transporting a man or a robot into different universes, an idea even more implausible than a machine for sending a man back in time. The mystery of consciousness is the mystery of how consciousness arises from matter, something that seems to be entirely different from consciousness. Philosophers have long pondered this question. We currently have no understanding of how this occurs. There are various exotic theories, such as Roger Penrose's theory involving quantum effects in microtubules. Some think that solving the mystery of consciousness is just a matter of increasing the resolution of brain scanners. Some optimists think that if we can only scan neurons with ever more detail, and understand more precisely the exact chemistry and physics of brain actions, we will one day understand the mystery of how the brain produces consciousness. Others think that no matter how much progress we make in understanding the brain, we will never be able to understand exactly how consciousness is produced by it. They point out that we can never imagine seeing some high-magnification photograph from an electron microscope or a diagram of a chemical reaction or a printout of brain electricity, and then really understanding how consciousness could arise from that. Because such reasoning seems powerful, I estimate that there is no more than 1 chance in 5 that we will solve the mystery of consciousness in the next fifty years. Most of the great mysteries of nature are not things we should expect to see solved in our lifetimes. Get used to living in a mysterious universe, for it is most unlikely that more than one or two of the deepest mysteries will be cleared up in your lifetime. There will be fantastic advances in computing power and robotics in your lifetime, but that will do us very little good in solving most of the great mysteries that face us. As far as how we can best spend our money to help solve age-old mysteries, the technology with the best chance of producing results is probably not hugely expensive particle colliders costing many billions, but instead relatively inexpensive radio telescopes that can be constructed with only millions of dollars. Besides offering the hope of solving the age-old mystery of whether we are alone in the universe, such devices might allow us to receive radio signals from beings vastly older than us. Conceivably they might give us the answer to cosmic mysteries that might take us many thousands of years to solve on our own. Could Another Civilized Species Have Arisen on Earth Before Humanity? A fascinating question to consider is: could some other civilized species have appeared on our planet long before the current race of humans appeared? I refer to the possibility that civilized intelligent life may have arisen on this planet many millions of years ago, such as 10 million years ago, 20 millions years ago, or 30 million years ago. Most people will immediately dismiss such a possibility, using reasoning such as this: Of course, mankind must be the first civilized species to have appeared on our planet. If there had been some previous civilized species, they would have left many traces of their existence which we would have detected long ago. Such an argument at first seems very powerful, but it is by no means conclusive, for several reasons I will now list. Evidence of a previous civilization might have been slowly wiped out by eons of erosion, decay, biological processes, and previous geological upheavals. Life After People was a fascinating recent television series that dealt with the question of how soon the structures of human civilization would break down and disintegrate if man were to suddenly disappear. The answer often given by the series was: surprisingly soon. 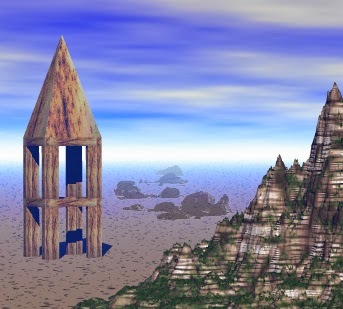 This television series was constantly stating that large human structures such as skyscrapers and bridges will break down and crumble over centuries or thousands of years, if there is no one around to maintain them. A simple example is a bridge. Given a few centuries with no maintenance, sunlight will cause paint on the bridge to flake and peel, rust will cause the steel to weaken, and the bridge will then collapse. Another example is roads. Given many years of no maintenance, and many years of freezing temperatures, cracks can form in roads, which winter ice will then widen. Given thousands of years with no maintenance, the road will disintegrate. Then there are long-term geological processes, which tend to break down and cover up existing structures. Examples are earthquakes, glaciers, sedimentation, volcanoes, asteroid collisions, flooding, and continental drift. Acting over millions of years, such processes may have completely buried evidence of a civilized species that may have existed before our species. But wouldn't there be many fossils of such a species, if it had existed? Not if the species buried its dead without coffins. When bodies are buried without coffins, the bones will normally disintegrate within a few thousand years. It usually requires a freak geological occurrence (such as being surrounded by tar or amber) for a bone to be preserved for millions of year. A previous civilized species on our planet may have become extinct before it became industrialized. If you think about the possibility of a civilized species existing on our planet long before the current race of humans, you may think of it having all the trappings of modern industrial civilization. But a civilized species could have arisen on this planet millions of years ago, and become extinct long before reaching the industrial age. Wars, plagues, natural disasters or climate change (such as the onset of an ice age) may have made such a civilized species extinct. If a civilization perished long before reaching the industrial age, it might have left relatively few traces of itself. Cultures such as the ancient Romans and the Egyptians (with their tendency towards gigantic engineering projects) are less common than cultures which leave smaller traces of their existence. Evidence of a previous civilization may have been quickly wiped out by a planet-wide war or natural catastrophe. There are several possibilities for a planet-wide catastrophe that could have entirely wiped out traces of a previous civilized species. One is a global nuclear war. Imagine nuclear war involving the explosion of, say, 50,000 200-megaton bombs. That might have been sufficient to instantly remove almost all traces of a previous civilized species. If such an event had occurred millions of years ago, we might have no evidence of it today. Another possibility is that an asteroid might have struck the planet, causing a planet-wide upheaval that buried all traces of a previous civilized species. Another possibility is a gigantic volcanic eruption like the one that supposedly occurred out of Yellowstone Park in the United States about 640,000 years ago, burying land 1000 miles away in ten feet of ash. If there had been a particularly bad eruption millions of years ago, it might have buried all evidence of a previous civilization under many meters of dust and ash. A previous civilized species on our planet may have migrated to somewhere else, and removed all traces of its earthly existence. Imagine if a civilized species had arisen millions of years ago, and had developed interstellar travel. Such a species might have migrated to other planets. But surely, one may say, such a species would have left behind many monuments on our planet, to commemorate its previous existence on our planet. This would not necessarily be true, however. If such a species were to evolve to some higher state of existence, it might look back with contempt at its original state when it existed on only one planet, thinking of such a state as being utterly primitive. Such a species might have no interest in preserving the monuments of its younger days. Just as you might throw out a scrapbook of your elementary school achievements, a species that had reached some interstellar level might want to erase all evidence of its youthful existence on our planet, and restore Earth to a purely natural state. Thousands of years after developing interstellar travel, such a species might have developed some refined new standard of beauty for architecture, and might then have regarded all of the buildings it had erected on our planet as primitive and ugly, no more worthy of preservation than some grass huts built by a primitive tribe. Such a species might then have decided to remove all of the traces it had left on our planet, and to restore the planet to its natural beauty, leaving it as a kind of giant park. We probably are the first civilized species to arise on this planet, but in light of all of these possibilities (and others that can be imagined), we really can't be sure whether civilization first arose on our planet several thousand years ago or millions of years ago. The extraterrestrial spaceship appeared suddenly in orbit around Earth. People were not impressed by its size, since it was only 60 meters in length. Everyone waited anxiously to learn some sign of the visitor's intentions. At 10:00 PM on July 23, the visitors from far away announced their intentions. People all over the world suddenly saw on their television screens and computer screens two words that flashed over and over again: the words SURRENDER NOW. The President of the United States held a meeting with his generals to discuss the new threat. “How big a threat are these aliens?” asked the President. “What about the possibility of an offensive strike against the ship?” asked the President. The President went on television to deliver a speech to the American people. He knew the whole world was listening. NASA and the military readied the rocket launches that would carry the nuclear missiles into space. American citizens were organized into home defense units. Citizens used their pistols and shotguns in their backyards, to practice blowing up aliens. The spaceship from another planet then launched its only attack against Earth. It was an invisible attack, too small to be seen by the human eye. The attack consisted of swarms of tiny flying electronic nano-devices, each the size of a grain of sand. One swarm went towards Washington D.C. The nano-devices had been supplied with information allowing them to find the centers of power in Washington: the White House and the Capitol building. One of the nano-devices flew right through a door in the White House. No one noticed it because of its tiny size. The nano-device flew into the Oval Office, and detected the President of the United States sitting at his desk. The device flew into the President's left ear. The President noticed a tiny little itch in his ear, and scratched it, but paid no further attention to it. Meanwhile, the little nano-device traveled towards the President's brain. The device broke up into a swarm of smaller units that made their way into the President's brain. The smaller units began reprogramming the President's mind. Something similar happened in the Capitol building. A swarm of flying nano-devices entered the building one by one, each too small to be noticed. Each of the tiny devices entered into the ear of a congressman or senator. The same thing was happening in Moscow, Beijing, and other world cities. The President consulted with congressional leaders, and then asked all the main leaders of the world to meet with him in Washington D.C. After a five-hour private meeting, the President gave a speech to announce the results to the world. A craft from the alien spaceship then landed on the White House lawn. Out of the craft emerged small blue creatures only twenty inches tall. No one opposed the little creatures as they walked into the White House. The White House's flag post was waving a white flag. The aliens thought they had taken over the planet without firing a shot. But outside the halls of government, in the halls of schools and apartment buildings and offices, a massive tide of resistance started to organize. The heroic resisters soon discovered the ultimate defensive weapon against the aliens: the common earplug. Is There Any Flab in Nature's Fundamental Blueprint? An interesting question to consider is whether the universe is built on a kind of blueprint that has a significant amount of excess or flab. If we look at the fundamental layout of particles, and find a great deal of excess and waste, this might perhaps tend to confirm the suspicions of many pessimistic thinkers that the universe is the daughter of pure blind chance. Below is a typical diagram used to illustrate the Standard Model of particle physics, which is the closest thing we have to nature's fundamental blueprint. Where here can we find some flab in nature – something that is hanging around, but is not needed? We certainly could not get along without the Up quark or the Down quark, because they are the constituents of the protons and neutrons that make up the nucleus of an atom. There are two Up quarks and one Down quark in a proton, and two Down quarks and one Up quark in a neutron. We also could not get along without the electron, as it is a vital part of any atom. As for the photon, that is certainly needed, as sunlight itself consists of photons. The gluon is needed because it is believed to play a key role in the strong nuclear force that holds together the nucleus of the atom. There are also reasons (much less obvious) why we need the three types of neutrinos in the Standard Model (the electron neutrino, the muon neutrino, and the tau neutrino). Although they might seem to be useless “ghost particles,” neutrinos are a critical element in supernovae explosions, the explosions of stars which create and spread around all of the heavier elements that are used in our civilization. Among the elements believed to be created entirely by supernova explosions are nickel, copper, zinc, germanium, selenium, tin, silver, gold, lead, and uranium. According to this link almost all of the energy of a particular supernova was transmitted through neutrinos. So we can't classify any of the neutrinos as being flabby parts of nature's blueprint. Living in an advanced industrial civilization, we can't dismiss as “useless” particles such as neutrinos that help to spread around the heavy elements needed for an advanced industrial civilization. As for the W boson and Z boson particles, they are believed to play a crucial role in the weak nuclear force, which is believed to be important in supernova explosions. Such explosions are very useful for any industrial civilization needing heavy elements such as the elements listed above. This scientific paper says that there would not be enough oxygen if we did not have the weak nuclear force. Not shown in the diagram above (but shown in other diagrams of the Standard Model) is the Higgs boson. That particle is believed to be vitally necessary because it helps to give mass to other vitally needed particles, as explained here. So far we have found everything in the Standard Model to be useful. But we still have not discussed some particles that have sometimes been described as superfluous particles: the Charm quark, the Strange quark, the Top quark, the Bottom quark, the tau particle, and the muon particle. But in fact there is a better reason to be skeptical of the fine-tuning claim: the indisputable fact that there are many features of the laws of nature which don't seem delicately adjusted at all, but seem completely irrelevant to the existence of life. In a cosmological context, the most obvious example is the sheer vastness of the universe; it would hardly seem necessary to make so many galaxies just so that life could arise on a single planet around a single star. But to me a more pointed observation is the existence of ''generations'' of elementary particles. 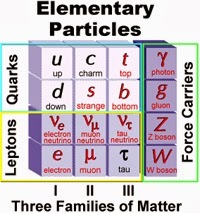 All of the ordinary matter in the universe seems to be made out of two types of quarks (up and down) and two types of leptons (electrons and electron neutrinos), as well as the various force-carrying particles. But this pattern of quarks and leptons is repeated threefold: the up and down quarks are joined by four more types, just as the electron and its neutrino are joined by two electron-type particles and two more neutrinos. As far as life is concerned, these particles are completely superfluous. All of the processes we observe in the everyday workings of the universe would go on in essentially the same way if those particles didn't exist. Why do the constituents of nature exhibit this pointless duplication, if the laws of nature were constructed with life in mind? The previous paragraph is very densely packed with absurd and misleading reasoning. The first ludicrous claim (strangely referred to as “most obvious”) is that the vastness of the universe is somehow an argument against the idea that it is fine-tuned, with the lame suggestion that an intelligent designer would only be interested in creating one planet with life on it (rather than many planets with life). That is one of the silliest arguments I have ever heard, and makes as much sense as arguing that if there were a writer he would write no more than one sentence, being forever satisfied with having created just one. The next mistake is in insinuating that the second and third “generations” of quarks are somehow an example of superfluous excess. Carroll knows full well that the second and third “generations” of quarks have lifetimes of less than a millionth of a second, and that they decay into the very Up quarks and Down quarks that make up protons and neutrons, and are therefore absolutely necessary for our existence. More than 99.99999999999% of the quarks that actually exist in our galaxy are Down quarks and Up quarks (the other types never existing for more than a millionth of a second, and only in particle accelerators and a few freaky stars). The same thing is true for the tau and muon particles, which last than less than a second, and decay into the electron particle that is essential for our existence. So to complain of “pointless duplication” is wrong. There is no such duplication. The particles that Carroll calls “completely superfluous” particles are the direct ancestors of the vitally necessary particles, and are no more superfluous than your grandmother was superfluous to your existence. For physicists to speak of “generations” here is very apt to give you the wrong idea, because when you hear the term generation you think of the forty years of a human generation. But in reality the second and third “generations” of quarks exist for less than a millionth of a second before decaying (directly or indirectly) into the vitally necessary first generation. Complaining about that length of time as some example of wastefulness is like complaining if a short-order cook takes a millionth of a second to make your food. As for the neutrino particles, it may be technically correct to say “the processes we observe in the everyday workings of the universe would go on in essentially the same way if those particles didn't exist.” But that is a very misleading turn of phrase, because as discussed earlier, if those neutrinos hadn't existed, supernova explosions (not an everyday occurrence) wouldn't work, the heavier elements would not have got spread around, and we wouldn't have here on Earth many of the elements used for industrial civilization. So neutrinos also cannot at all be classified as useless excess particles, some flab in nature's blueprint. I will now introduce two tables that will help to clarify these points. The first table is an improved table showing the particles of the Standard Model, a table that will make clear which particles are stable particles lasting longer than a second, and which particles are short-lived particles lasting less than a second. The stable particles are shown in blue. All other particles have lifetimes of only a tiny fraction of a second. 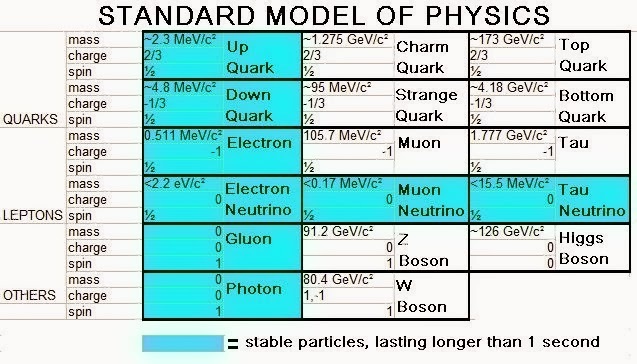 In judging whether there is flab in the Standard Model, we really need concern ourselves only with the particles shown in blue above. For the reasons given earlier, all of these particles are necessary. We know that neutrinos are necessary for the production of heavy elements in supernovae explosions. I don't think any one has ever done an analysis judging whether we would have as many heavy elements if one of these three types of neutrinos did not exist, so we should assume for now that all three are necessary for a universe with as many useful heavy elements as we have. Another useful table is the table below. In this list I list each type of particle in the Standard Model, and I explain why each type of particle is relevant to life or civilization (in the sense of either being directly necessary itself for life or advanced civilization, or a particle that is a predecessor of some other particle that is relevant to life or civilization). The decay paths shown are typical decay paths, among the most common (a particle will often have multiple ways of decaying). To save space, I have not listed all the particles produced in the decays described, but only the relevant ones. Notice the important summary at the bottom of the chart. Considering only regular matter (not antimatter), and considering a particle to be relevant to life or civilization if it is either directly relevant or decays into some other particle that is relevant to life or civilization, I find that there are zero unnecessary stable particles, and zero particles irrelevant to life or civilization. 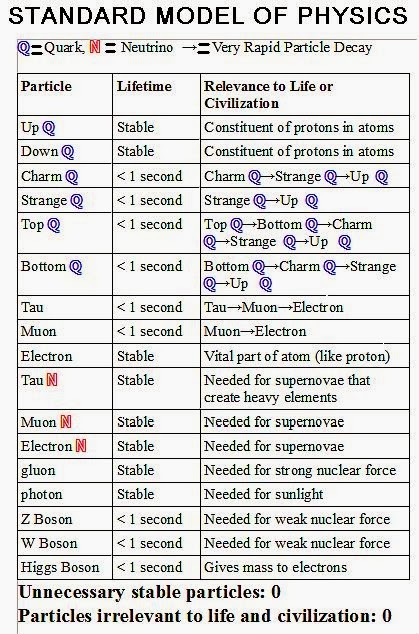 Like most tables summarizing the Standard Model, these visuals do not depict any antiparticles. But what if we were to consider antiparticles? Aren't antiparticles a great example of pure flab in nature's fundamental blueprint? There are two reasons why antiparticles should not be considered as flab in nature's fundamental blueprint. The first reason is that there seem to be subtle reasons why our universe would not work right or not be stable if antiparticles did not exist. In his book Symmetry and the Beautiful Universe (page 234), Nobel Prize winning physicist Leon M. Lederman suggests complicated reasons why “the whole universe could not be stable” if antiparticles were not part of the overall blueprint. The second reason is simply that antiparticles don't exist in nature for more than a tiny fraction of a second. This is because whenever an antiparticle comes into contact with a regular particle, both are converted into energy. As there seems to be no evidence that even 0.00000000001 percent of the universe is antimatter, one can't plausibly cite antimatter as an example of flab in nature's fundamental blueprint. Could we perhaps cite dark matter or dark energy as an example of flab in nature's fundamental blueprint? No, not at all. Neither dark matter nor dark energy is covered by the Standard Model, so we are pretty “in the dark” here (pardon the pun). But scientists do think that dark matter seems to be a vital element in explaining the current structure of the universe, and that galaxies would not even hold together without it. Scientists also say that galaxies would not have expanded at a suitable rate (and galaxies would not have formed) if dark energy did not exist. So we have looked for flab in nature's fundamental blueprint, and we have come up short. The blueprint seems to be flab-free. We might say that nature's fundamental blueprint is lean and mean. Metaphorically, we might say it is composed essentially of nothing but muscle and bone. We can easily imagine a universe with lots of flab in its fundamental blueprint, a universe with thousands of different types of stable particles cluttering up space, with only a few of them being the type that combine together to make atoms. Our universe has no resemblance to such a universe. Scientists are working on extending the human lifespan. It is entirely possible that within a few decades the human lifespan might be fifty years longer. Most people think that such an outcome would be extremely fortunate. But there are some serious downsides and disadvantages that might arise from a human lifespan that long. Below is a list of six drawbacks. Wealth inequality might increase. The United States has a grave problem with excessive wealth being concentrated in the hands of the few. In this year's State of the Union Address, President Obama reported that the wealthiest 1% own 40% of the wealth in he United States, and the bottom 80% own only 7% of America's wealth. If people live to be 125, the wealth inequality problem would probably increase very significantly. The main reason is that death is a major factor that helps to limit wealth inequality. When very rich people die, the government gets a large share through inheritance taxes, and usually the person's fortune is divided up among several people. If the very rich are living to the age of 125, that end-of-life wealth redistribution is delayed for several decades. Unemployment might increase. In many fields it is very hard for young people to find a job, partially because of all of the older people holding on to their jobs. If people live to be 125, people might hold on to their jobs until they are 90 or 100. One can only imagine how negative an effect that might have on the unemployment rate. Retirement programs might bankrupt. A program such as Social Security was designed under the assumption that people would typically die around the age of 70 or 75. What happens when people start living to be 125? It might be enough to send many a retirement program into bankruptcy. Overpopulation might get worse. The world's population was 6 billion in 1999, but grew to 7 billion in 2011. It is predicted to grow to 7.7 billion by 2020. By the time we develop science for 125-year lifespans, the world might be groaning under a terrible overpopulation crisis (exacerbated by global warming and resource depletion). Much longer lifespans may make the problem significantly worse. The extent of this difficulty will depend on how expensive lifespan extension is. If scientists develop a fairly inexpensive youth pill, and billions start living beyond the age of 100, this might make overpopulation much worse. But if life extension depends on very expensive techniques that only the rich can afford (as depicted in the visual below), the effect on overpopulation might be fairly small. Dementia might proliferate. Longer lifespans might be produced by the introduction of some general technique or medicine that slows aging in all parts of the body. But it is just as likely that longer lifespans will be produced through techniques that allow people to replace or rejuvenate particular parts of the body. In the latter case, there will be a very great risk that people will get younger hearts, younger livers, younger lungs, and younger arteries before they get younger brains. The reason for this risk is that the brain is much more complicated than any other organ in the body. Compared to the brain, the heart and the lungs and the liver are ridiculously simple (and might well be produced by sophisticated 3D printers). So probably decades before there is anything like a technique for rejuvenating the brain (or stopping the aging in the brain), there will be techniques for replacing the heart or the lungs or the liver. Why is this a problem? It's because people will be tempted to make organ replacements that give them much longer lifespans, but leave them with the same old brains, brains that will tend to become demented when people reach an age of 85, 90, or 95 (because of Alzheimer's disease, strokes, and normal brain aging). One can only imagine what a cruel twist of fate this might end up being. An 80-year-old might have an operation giving him a new heart, followed by an operation giving him new lungs. He might then rejoice after being told he can look forward to forty more years of life. But then five or ten years later, he might become demented and senile. His extra decades might be spent in a state of vacant senility in a nursing home, at tremendous cost to society. So people now about 50 or 60 may be faced with a very tough choice in a few decades. You may be told that some fancy high-tech operation may give you 30 years of additional life, with the risk that you may be spending half of that time as a senile, demented person in a nursing home. Which choice will you make? Let us hope that they come up with huge breakthroughs in preventing dementia and strokes, medical science that you will be able to afford, so that you will never face such a choice. At first they thought an asteroid was going to hit the planet Earth. A worldwide panic ensued. But a few days later, the astronomers changed their story. The object hurtling towards our planet was not an asteroid, but a gigantic alien spaceship. Mankind was about to receive its first extraterrestrial visitors. The spaceship went into orbit around Earth, and began to make radio contact with scientists. After a rather long period during which the extraterrestrials studied our language, the aliens finally broadcast their intentions to the scientists. The scientists briefed the President of the United States at the White House. “So is it good news or bad news?” asked President Jill Trenton. On the day of the landing, high officials from Washington came to the Vietnam Veterans Memorial, along with an army of reporters and scientists. They watched as the landing craft slowly descended from the sky, and landed in the large grassy area. President Trenton was flanked by Barry Tyler, who was there to give last minute pointers on the all-important meeting of two different races from two different planets. “Good God, what have you got me into?” asked President Trenton. Two aliens emerged from the landing craft. One was holding the gifts to be given to the President. The other alien approached the President slowly, wagging its slimy tentacles. President Trenton was shocked by the hideous appearance of the revolting alien. It was the ugliest and most repulsive thing she had ever seen. At first she thought to herself: I've got to do this. But then she visualized the five slimy tentacles wrapping around her head. The image made her want to vomit. “No!” cried President Trenton. “No, no, I can't go through with it!” She departed the landing area, going back to the White House. The aliens soon became aware that an unforgivable breach in ritual protocol had occurred. Feeling rebuffed, they returned to their landing craft, which lifted off, and returned to the much larger mother craft orbiting the planet. A few days later, the huge spaceship hurtled off into the voids of space, never to return. At the White House there was a post-mortem to discuss the diplomatic fiasco that had occurred. “Before the aliens left, they told us about what the gifts were, the gifts we're never going to get,” said Tyler. “What were they – some crummy souvenirs from their measly little home world?” asked President Trenton cynically. If extraterrestrials ever arrive, they might be interested in the physical conquest of our planet. Or conceivably they might be interested in spiritual conquest. Their purpose in coming might be to spread some strange alien religion to distant spots in the universe. But if they were trying to do that, what type of religion would have a good chance of being successfully spread to distant parts of the galaxy, given sufficient enthusiasm in those who were spreading the religion? To answer that question, we should first look at what type of religions would tend to be very hard to spread across multiple solar systems. It would seem that the hardest religion to spread to many other planets would be one that was highly location-oriented. I will give an example to explain what I mean. Learn, little Earthlings, the glorious deeds that occurred 9,400 years ago on the distant planet Arzurus. On the continent Zynora in the land of Telsun there walked the great prophet Olnor, who received the holiest truths ever revealed. Many a miracle did he work back in those days, proving the truth of his supernatural claims. Would a large fraction of the world's population be likely to give up their religious beliefs, and adopt this strange new creed? I don't think that is likely. This strange creed would not be very suitable for spreading to many distant solar systems, because it would be so location-oriented. Someone on some other planet would hear about these events on the planet Arzurus long ago, but these events would probably seem very distant and remote. A person on our planet would react to such a narrative perhaps no more warmly than the average person reacts today when he hears about the discovery of some distant galaxy from the earliest ages of the universe. The events would seem so remote and distant that it would be hard to incite the fervor typically associated with the successful spread of a religion. But what type of religion might have a relatively high chance of being spread across multiple solar systems? Perhaps it would be one that was more universal, some creed that was not centered upon events occurring on one particular planet, but on truths or principles that make equal sense on any planet. I can imagine some elements that might be parts of a successful galactic religion. Such a religion might have one or more of these elements. A belief in some God of the universe. A galactic religion might tend to be more successful if it preached some gospel of a universal deity, not some deity who seemed to have his attention focused on one particular planet. Such a doctrine could be supported by a discussion of fine-tuning in physics and cosmology, involving fundamental physical constants that are the same to all observers in our galaxy. A belief in some universal mystical force. We can plausibly imagine a successful galactic religion that is somewhat akin to the Jedi creed in the Star Wars movies, with a belief in some universal force that an individual on any planet can somehow access and use to his benefit or enlightenment. A belief in some interplanetary brotherhood or interplanetary communion of minds. The life forms living on different planets might be tremendously divergent in their physical appearances, but conceivably some successful galactic religion might attempt to dissolve these differences, by describing some basis by which all life-forms can be considered brothers or kinfolk, or describing some means by which distant life-forms can somehow commune with each other, possibly through some type of instantaneous mysticism. A belief in some higher destiny or state of evolution towards which individual life-forms can strive. An element in many a successful religion is the idea of progression, wherein the individual progresses to some higher state of being. 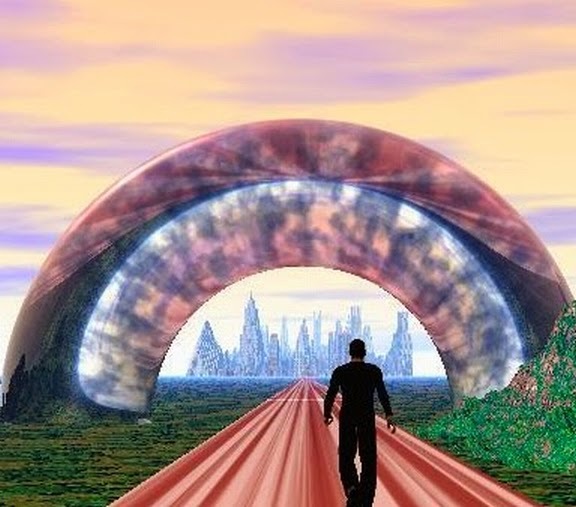 We can imagine all kinds of futuristic galactic permutations on this theme, including evolution to a state of superintelligence, evolution to a state of pure energy, evolution to a purely electronic state of existence, and so forth. One of these might be an element of a successful cosmic religion, with the progression being described as some glorious destiny to be achieved, perhaps a little like the Buddhist ideal of nirvana. A belief in some immortality that can be reached. Besides supernatural concepts of life after death, a successful galactic religion might have any number of technological descriptions of immortality, similar to those we already see developing in transhumanist circles, which imagine people becoming immortal through breakthroughs in medical science. A belief in some paradise or awesome state of organization towards which societies can strive. Christian theology has postulated some future millennium to be achieved by divine intervention. A successful galactic religion might imagine some desirable state of existence to be achieved by galactic societies, perhaps involving the godlike mastery of matter in particular solar systems, or perhaps involving the establishment of some kind of galactic empire or society of planets or a cosmic Utopia. Rituals, stories or architecture that evoke awe and wonder. Earthly religions have evoked awe and wonder through stories of miracles, and through music and awe-inspiring architecture. Having the whole grand stage of galactic evolution and countless planets to work with, a galactic religion might find it easy to evoke far greater awe and wonder. It might include far-flung tales a hundred times more wondrous than the story of the parting of the Red Sea, and it might have rituals involving all kinds of high-tech ways to stimulate the emotions of the faithful (including electronic brain stimulation, virtual reality, and mind-expanding drugs). The religion might involve soaring robot-created architecture a hundred times grander than the Notre Dame cathedral. A belief in some universal ethic. Some ethical precepts make sense at some times, but don't make sense in other times (I can think of the example of “Go forth, and multiply,” which makes sense until you have a population explosion.) A successful galactic religion might preach some universal ethic that would make equal sense in all centuries and on all planets. Such an ethic would not necessarily be radically different from some precepts of successful Earth religions. I'm not sure there's any fancy cosmic rule that might improve on the Golden Rule: do unto others as you would have them do unto you.